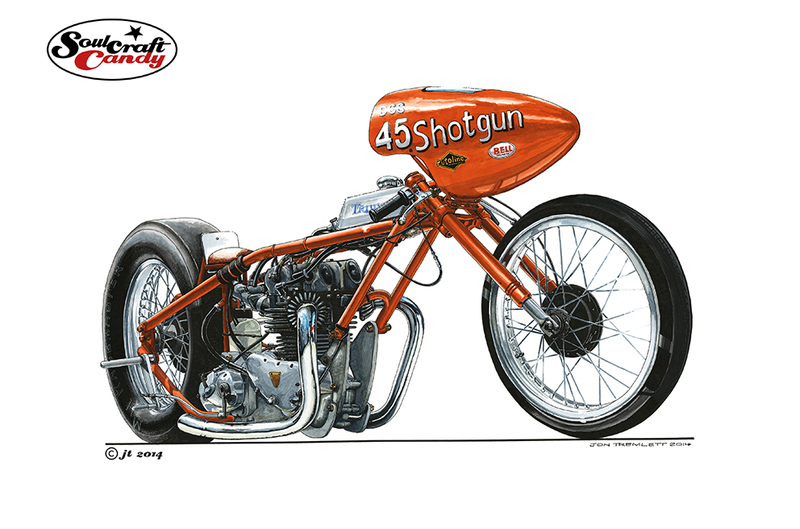 Shotgun drag bike – slowly the bike emerges from the paper. 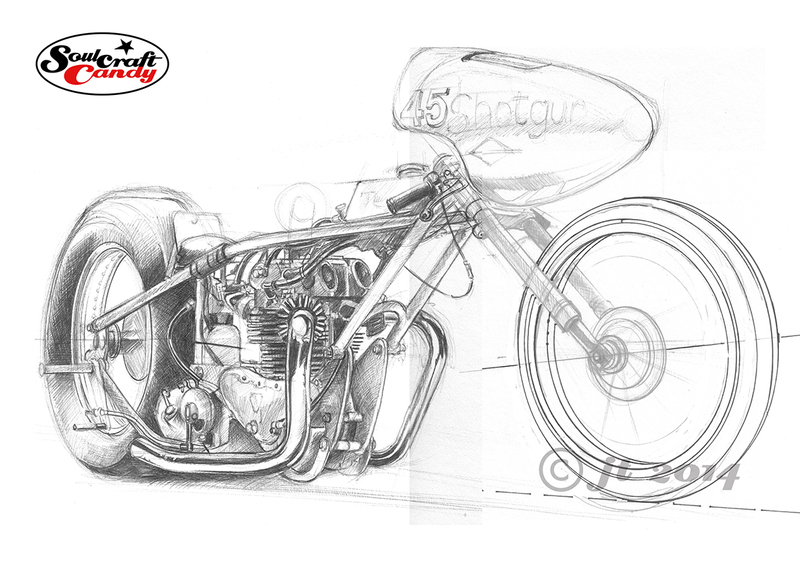 In a continuation from the previous post, here are some further images charting the progress of the Shotgun drag bike picture. 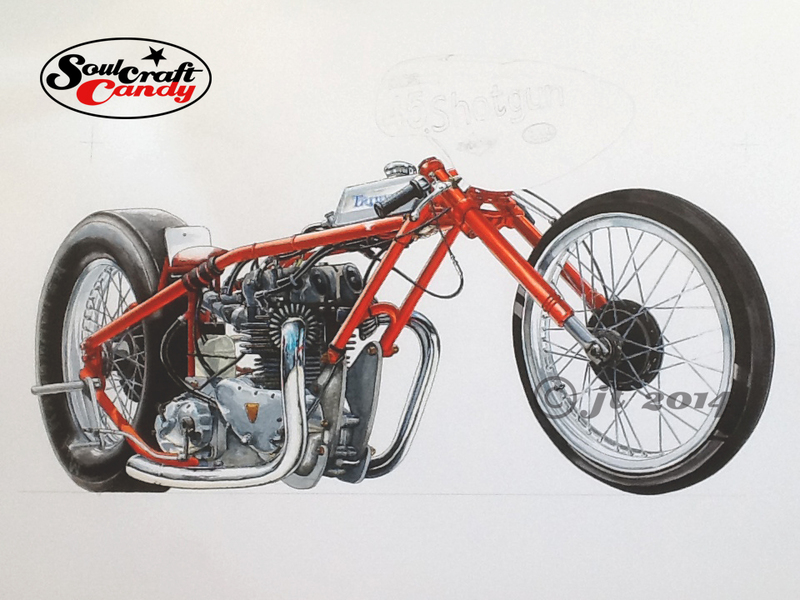 In this first one I’m still very much in the process of laying down the grey tones, and as you can see this pretty much covers most of the parts of this bike, including the tyres, which are not painted red. As I mentioned previously this is very much a process of laying on tone and building up to the desired intensity in small steps. Most people who’ve ever rendered anything will tell you that true black doesn’t really exist, and they’d be right. But with this style of drawing or painting I like to create areas of absolute black as they help give the image punch and underline the more cartoonish nature of the final picture. So where possible it’s good to get those bits done at this stage too. 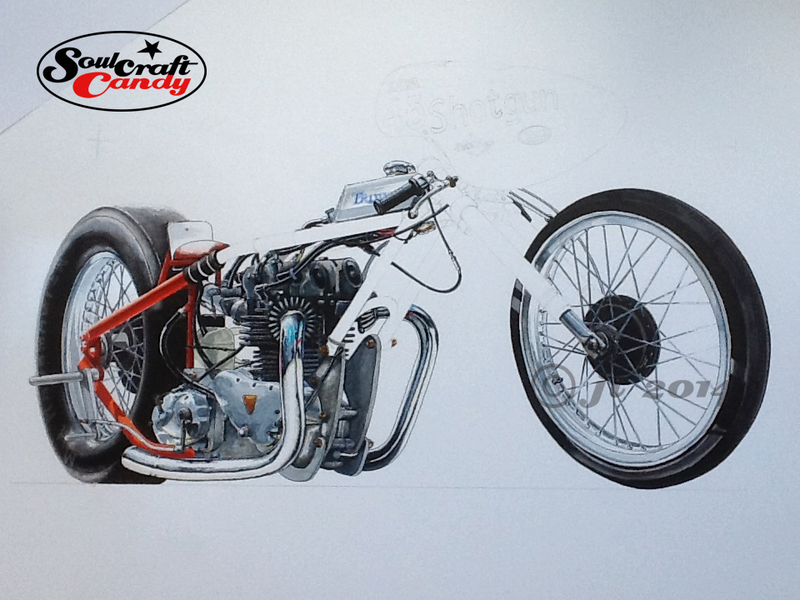 In this second image you’ll see that I’ve completed the exhaust pipes having finished with the greys, before starting on the frame colour. Exhaust pipes, especially chromed ones are a lot of fun to do, but they do rely on you having some decent reference material to work from. In this case there was plenty going on in the photograph, so the reflections are quite colourful and intricate. 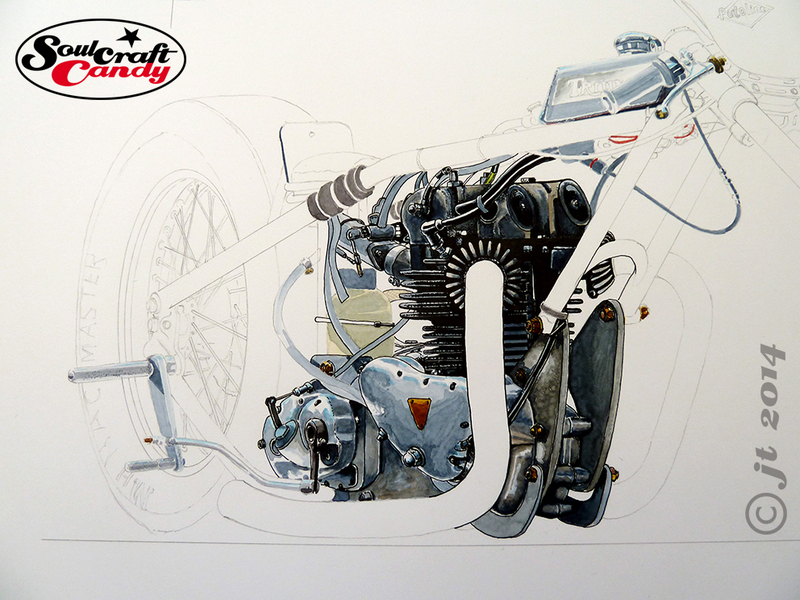 The engine, and therefore the near vertical exhaust pipe too, provide a real central anchor point for the picture and the reflections really help to draw the eye to the focal point of the image. This final image shows the picture with the frame pretty much done. Again, this was a process of laying down slightly diluted tones of the red colour in steps, slowly building the colour up giving the frame tubes their form and highlight areas as you go. I took some time to get the base red right, mixing scarlet and orange inks to obtain something with the right amount of vibrancy. Diluted this gave a lovely pink for the lighter areas and with a bit of dark rich brown mixed in created a great tone for the shadows. It can be a bit nerve wracking when working with such strong colour as the last thing you need is to smear it across an area where it’s not wanted, or worse, get a small droplet landing on your pristine white surround. Once this stuff is down, there is no way to get rid of it or cover it up. But taking your time and working slowly and methodically pays dividends, and allowing things to dry every few minutes is a good habit to get into. By this stage the picture is really starting to jump off the page, the red frame bringing a whole new three dimensional feeling to the piece. Nearly there. 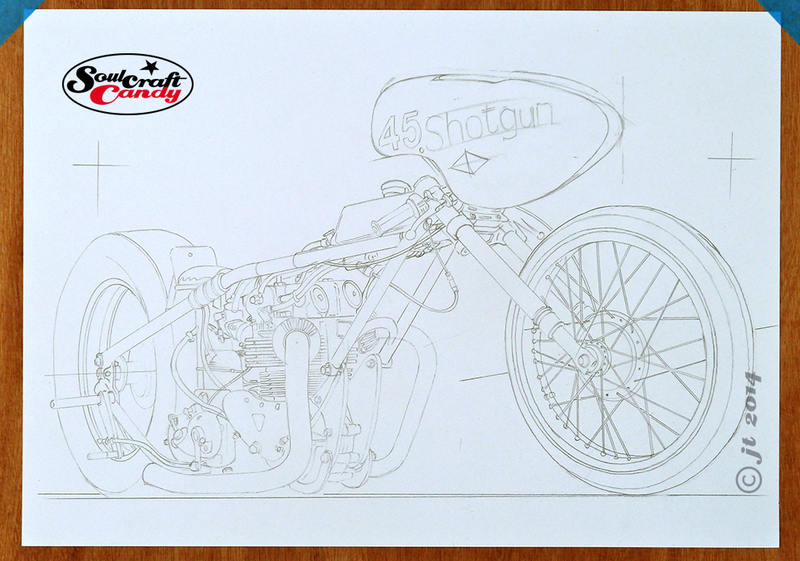 Shotgun dragbike – Finalising the layout. It’s been a very busy month since my last post, one that has seen this picture progress to being finished along with some other stuff too. rather than jump straight to the final image, here is a slightly retrospective look at the process I have been through in completing this commission. So this first image is of the final layout sketch which will now dictate how the picture will be in its final form. This one is traced through, using my little lightbox, on to an A3 sheet of good quality drawing paper using the previous sketch as an underlay. This stage is when I do most of the adjusting, moving things around slightly, changing some proportions here and there, and generally tightening things up. For the first time the drawing takes on a kind of crispness which really helps in being able to see properly what’s what and get the view finalised. Once I’m happy with this version, it’s pretty much ready to go and ready to be transferred onto the sheet of Bristol Board for the final rendering. This transfer stage is normally quite quick and easy, but this time was a rather fraught event. The size of the Bristol Board sheet was too large for the lightbox, the last thing you want is to crease or damage the paper whilst tracing through. Instead I had to rig up a makeshift lightbox using a small glass topped table and some desk lights and kneel on the floor to draw. It was hot day and the heat from the lights made the whole thing a rather nerve wracking affair, the board starting to warp after only twenty minutes. But it got done soon enough and I was really itching to get cracking with the colour phase. So this image is of the the engine after a couple of painting sessions. I don’t know exactly why, but I always like to start at the centre of the picture and work outwards. With the bikes this invariably means doing the engine area first. It’s actually a really good way to get started. The main constituent colour here is Payne’s Grey, either on its own or mixed with other colours for different hues and shades. Keeping the paint quite thin, colour and tone are built slowly in layers, it gives more control, and allowed to dry every now and then to stop paper warp and the surface from degrading through sogginess. Once I’m happy with an area I’ll get the technical pen out and start the process of outlining and blacking to start to bring the whole thing out of the surface and give it some punch. This also helps to set the early tone for the drawing and acts as a guide for putting down subsequent colour areas. Looking good so far. 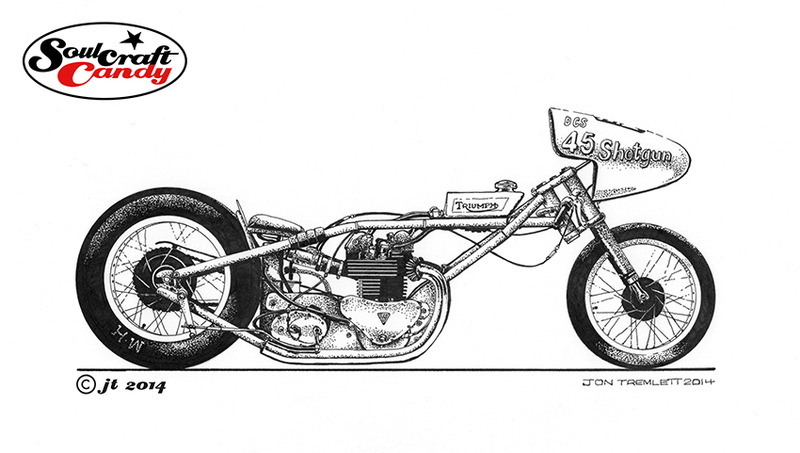 Drawing the Shotgun drag bike. The day before yesterday I travelled up to Leighton Buzzard in Bedfordshire to meet a very interesting chap who’d invited me to come and take a look at his old bike. 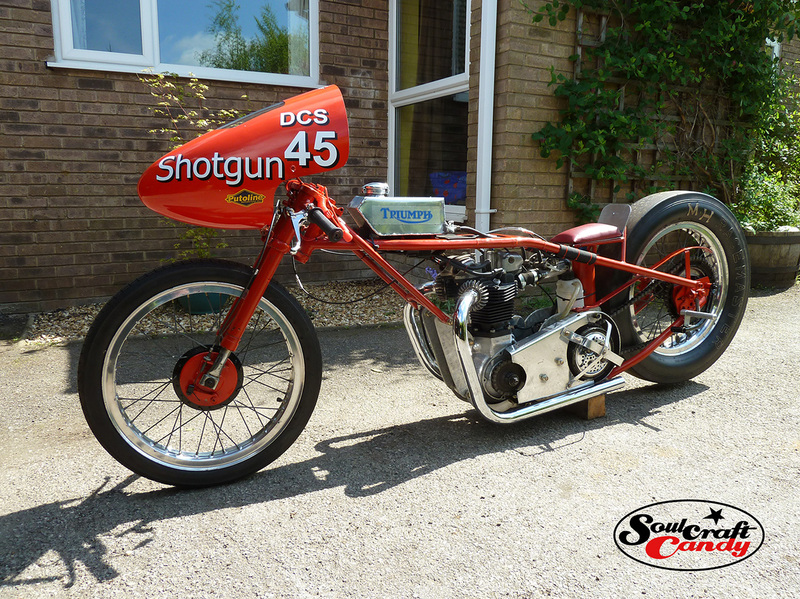 The fellows name is Nik Fisk and the bike in question is a Triumph engined drag bike called Shotgun built in the late sixties. Nik invited me over having made contact via the blog as he was very interested in commissioning a picture of Shotgun. 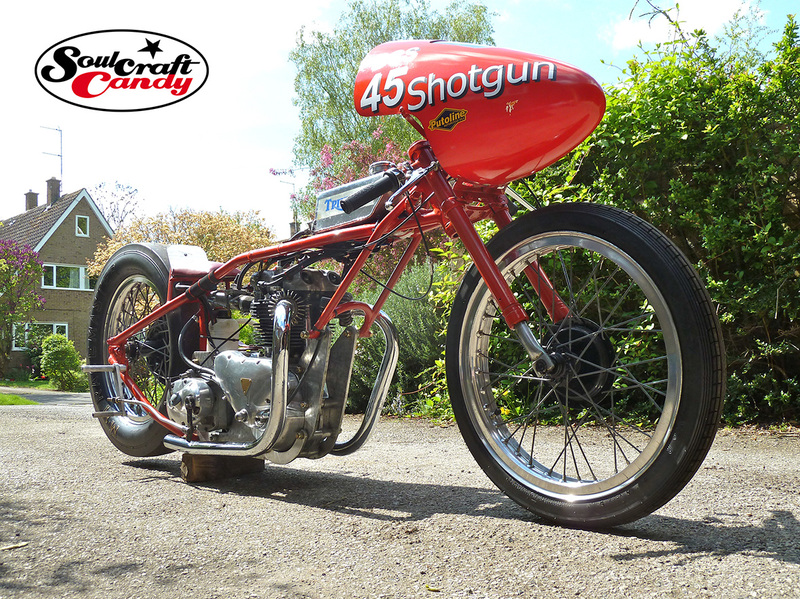 I’d read about this particular bike in Classic Bike magazine and had also, unwittingly, taken a photograph of Nik pushing it around the paddock at a Dragstalgia meeting at Santa Pod Raceway a couple of years ago. Our email exchange put all of these bits of information together and I leapt at the chance to go and take a look at this bit or drag racing history and meet the man himself. Hence I spent a very interesting, amusing and pleasurable Saturday afternoon standing in the driveway of a house in the village of Podington, where the bike actually lives in Nik’s mates Gordon’s garage. As the sun beat down we devoured home made sandwiches, supped tea, bantered a good deal and admired this wonderful machine. Nik was more than happy to fill me in on the long and varied history of the bike while Gordon, who does most of the spannering on it, elaborated on various technical points and added another layer to our rather humourous discussion. It was fantastic and the guys were wonderfully enthusiastic and knowledgable about both the bike and their experiences of the vintage drag race scene here in the UK. So this is now my next project. I’m going to have a go at doing a picture of the bike for Nik that he can use in his promotional armoury as he shows it as well as rides it. I’ll gather up my facts and tell you more about this lovely old bike and its life in a subseqquent post but, for now I just wanted to share a couple of pictures of it because it’s a real beauty. My thanks to Nik and Gordon for such a great day, I hope I can do their faith justice. Applying the thousands of ink dots that make up the shadow areas in the “Slugger” picture featured in the previous post, got me thinking about what the image would look like if it was in colour. This short period of playful thought led to the creation of this second image based on the same drawing. It seemed like a fun idea to start by turning the bike into a street machine, but something built for short sprints like dashing between sets of traffic lights. So it needed lights, some different handlebars and a license plate, all fairly easy to include. It also felt right that it should be brightly coloured, a reflection of the exuberance of the activity it was created for. So the main body of the picture employs the watercolour and pen technique used a good deal lately. I love the way it gives the pictures such a punchy look, almost jumping off the page and into your eyeballs. 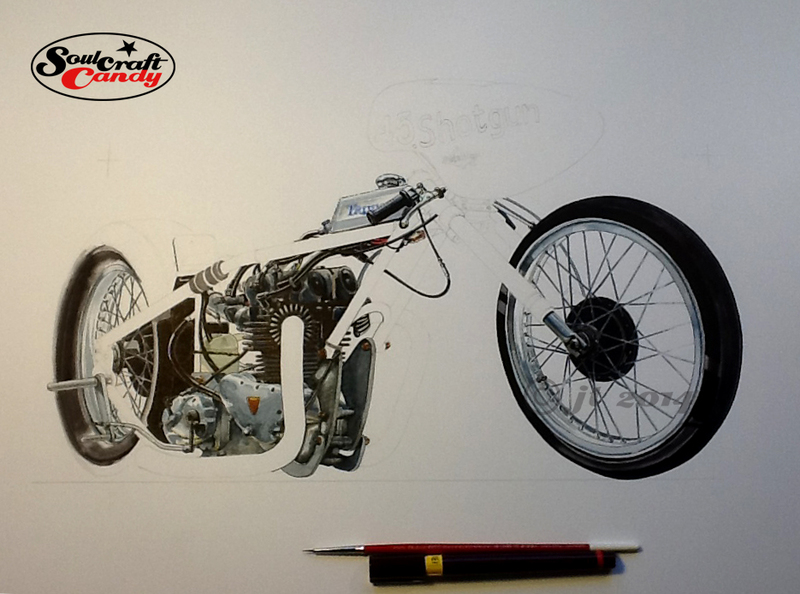 I so liked the dotted tyre shading from the last version I kept it in, contrasts nicely with the grey. 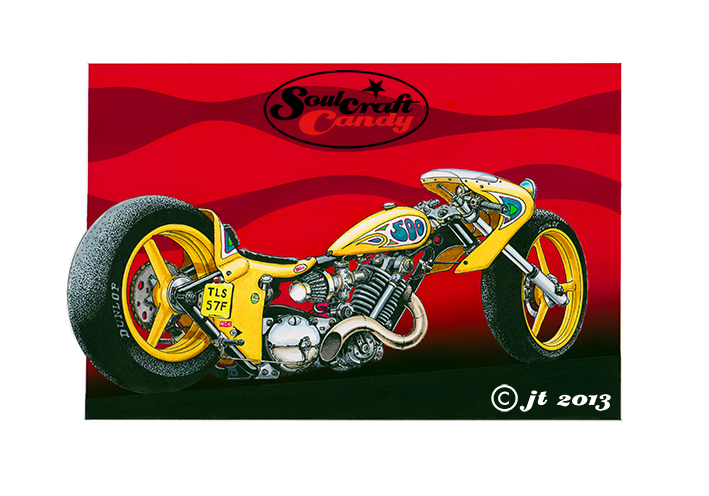 The bit I’m most pleased with though is the background, the bike really needed something big and bold behind it. I had a good fiddle in Photoshop before doing it, playing around with some ideas based around red, amber and green, the traffic light palette, but these merely made the whole thing look like some odd homage to Rastafarian culture. Needless to say they got dumped, too weird, too complicated, but the red element remained as it worked really well with the bright orange of the bike. This final version is simply primary red overlaid by a darker tint made by adding black. The background is air brushed using gouache paint. I covered the whole picture area with lo-tac film and cut around the bike very carefully with a craft knife, it always surprises me how little pressure is needed to cut the film so it pays to exercise the upmost patience. A solid red was then sprayed on and left to dry before removing the film. Another piece of film was then laid over and the lines for the wave forms were put on in very soft pencil. These were then cut out, again with a fresh bladed craft knife, and sprayed with tint made from the same red with some black added. Even though the picture already had a black ground line, the above process was repeated once more so that pure black could be sprayed on to give the gradient shading of the black area dissolving into the red. Challenging, messy and rather time consuming but the outcome is everything I wanted. It’s called “The Traffic Light Special”. It’s enough to make you dotty. A dragster in monochrome. Maintaining momentum, and keeping the creative juices flowing, is always one of the challenges one has to overcome when engaging in an artistic pursuit which has to fit in around the everyday goings on of ones life. It’s easy to loose the flow, and returning to an unfinished image rarely results in picking up the thread exactly where you left it. I suppose that one of the key disciplines of any artist is to develop techniques which enable you to do this as seamlessly as possible. I don’t have any hard and fast routines that I follow in order to make this easier but one thing I do do is always try and have a number of little projects on the go at any one time, all at different stages. This means that when I’m deep in thought about how to solve a problem on one picture, there is always another close by which I can engage with, one where the work is at a stage where I don’t have to overcome any issues in the execution. So dipping in and out of things keeps the creative ball rolling rather than running to a dead stop as endless time is wasted staring at a problem until the answer comes. In fact this act of “dotting about” helps me to uncover the answers that I’m looking for. So whilst pondering what to do about the background for the picture featured in the last post, I had a good look through the “pending ideas you should really finish” pile and pulled one out to serve as the “other” project. 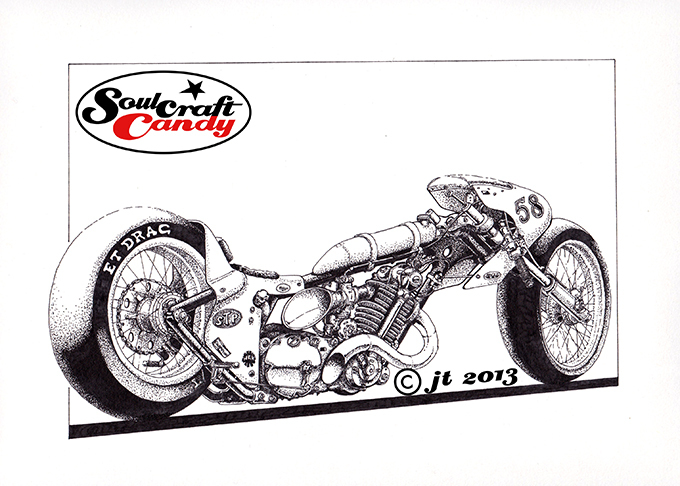 I had a dabble last year with some sketches following a visit to a drag race meeting, made a couple of drawings, and then promptly left it there. I’m not sure why. This drawing above was all ready for some treatment having been carefully pencilled out onto a nice bit of drawing paper, I just hadn’t thought much about how to take it further. I’m not sure what inspired my choice of technique, it could have been my recent visit to Tate Modern to see the Roy Lichtenstein show or something else entirely. Doing something different really appealed though and so out came the trusty old technical pens and I set to work. Although the dot shading is a madly labour intensive way to do things, this drawing proved to be very enjoyable to do and a pleasant alternative to the paint and ink technique I’ve been doing a lot of recently. You have to take a break every now and then though as all the little specks of black make your eyes go a bit funny after a while. It’s a lovely way to gradually build up tone though and really plays to the cartoon nature of the drawing. I’ve called it “The Slugger” after a certain baseball bat, a blunt though effective instrument that gets the job done. I hope you like it.